Yamaha Motor’s Joint MOTOBOT Development with SRI International — Phase 2 start toward actual circuit riding — - News Releases | Yamaha Motor Co., Ltd.
IWATA, January 7, 2016 - Yamaha Motor Co., Ltd. (Tokyo: 7272) announced today that the Company's humanoid riding robot - MOTOBOT- has moved into its second phase of development, and that the current partnership in joint development with SRI International (hereafter SRI) is set to continue. Presentations on the MOTOBOT headed by Yamaha Motor and SRI representatives are scheduled to take place on January 8 (local time) at the CES - the global consumer electronics and technology tradeshow being held in Las Vegas, where in recent years, fields such as autonomous driving and robotics have been featured. 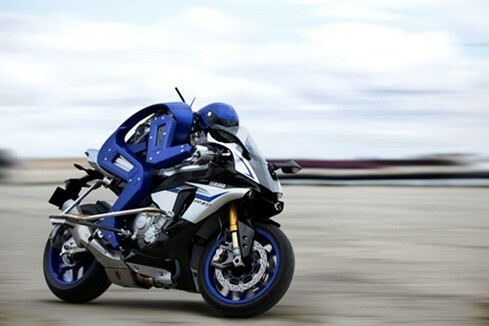 Being an automated humanoid robot able to ride a non-modified motorcycle, the MOTOBOT became a hot topic of conversation when it was exhibited at the 44th Tokyo Motor Show in 2015. The objective is for a riding performance of over 200km/hr. on a riding circuit by 2017. In succession from phase one - phase two further develops the platform technology toward actual circuit riding. Furthermore, the sophisticated technologies acquired in achieving the high objectives detailed here are also intended to be applied to advanced technologies and rider support systems in the future, as well as other options that may segue into new business development. The development of the MOTOBOT is progressing as an open innovation model project with SRI as one of the world’s leading research and technology development facilities positioned as a very suitable partner in tackling the very unique and tough challenges involved with this project.